Adding hyperlinks is important for social media marketing because it gets your content on the web. Not only do you want to link to your own content within your blog posts, but you should link to other relevant content around the web and the blogosphere. 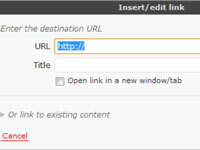 Linking helps index your pages on search engines. Links also help others find out about you and encourage them to add reciprocal links back to you. 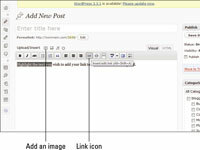 1Highlight the text you want to add a hyperlink for. For SEO purposes, anchor the link to a specific keyword. Do this by highlighting the keyword and selecting the hyperlink function. The Insert/Edit link dialog box appears. 3Enter the URL you want to link to. Don’t forget to include the http:// or https://. Voila! The text is now clickable. Links are what make the search engines notice you. 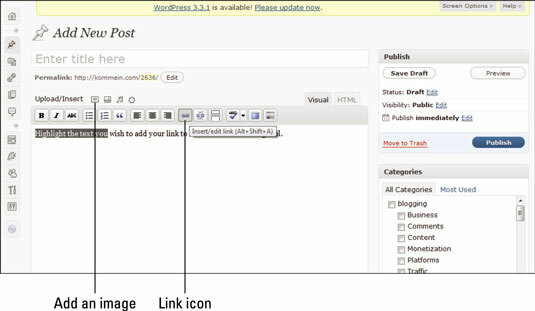 Thus, you want to link to as many pages within your content as possible. You also want to use linking as a reference for your readers. Linking allows you to refer back to a previously written blog post, without having to commit to paragraphs of unnecessary description text. Linking to other peoples’ content also helps you get noticed. When you link to someone else, you not only catch the attention of the blogger who will appreciate your sending traffic her way, but because most content creators allow trackbacks, a link to your post will either appear in the bottom of the other blogger’s post or in the comments section.